College is a great time for self-discovery and creating new experiences. You can take part in one or a few of the hundreds of student organizations on campus and start new friendships by meeting people. The undergraduate experience at UT Dallas is no exception. With new student organizations being created every semester and various, new courses being offered every academic year, UT Dallas is a place built for discovery. From academics to leadership and classroom to laboratory, there are plenty of ways you can expand your knowledge by stepping outside your safe zone. 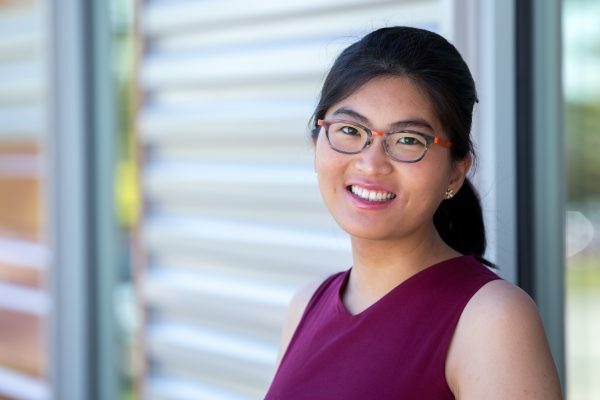 Hyunjoo Eunice Ko is a vivid illustration of a young scientist who made the most out of the various opportunities she discovered at UT Dallas. Eunice is a senior majoring in biology in the School of Natural Sciences and Mathematics who plans to attend medical school with the goal of one day influencing public policy. She credits her interdisciplinary approach to a career in medicine to her willingness of exploring new courses and taking on leadership roles. Early in her undergraduate years, Eunice enrolled in a Health and Illness class taught by Dr. Richard Scotch, professor of sociology, where she developed an interest in public health and policy making. In her sophomore year, Eunice and eleven other undergraduate students participated and won the Outstanding Delegation award at the National Model United Nations conference in Washington D.C., where university students debate over issues that are critical to international relations. The exposure to these new experiences encouraged her to apply for a David L. Boren scholarship, which allows students interested in national security to study languages in regions critical to U.S. interests, including Africa, Asia, Eastern Europe, and the Middle East. The Boren scholarship granted her a year studying Korean at Yonsei University. Determined to make the most out of her study abroad opportunity, she also sought out research opportunities. Dr. Jeon-Soo Shin, Chairman of Microbiology at Yonsei University College of Medicine, allowed Eunice the opportunity to collaborate with his immunology and microbiology research lab where she researched mechanisms of aseptic inflammation, specifically with relation to High Mobility Group Box 1 protein (HMGB-1). HMGB-1 holds an important role in inflammatory pathways in the human body. Future findings concerning the HMGB-1 protein may provide methods to help treat serious illnesses, such as sepsis. “I am incredibly grateful for the research experience that I gained while at Yonsei,” she says with delight. She also encourages undergraduate students to seek research opportunities beyond UT Dallas. Serving as the Honorary Member Director for Golden Key Club chapter on campus, she has developed event planning skills and the ability to build relationships. By organizing networking events, Eunice is able to connect student members with faculty for research opportunities and career mentorship. She is also the lead planner for the chapter’s annual honorary faculty induction. With a full agenda, Eunice finds the time to enjoy swimming, writing, playing video games, and trying out new foods. “I am also writing and coding a digital gamebook. I’m always surprised and pleased by how perfect UT Dallas is for me to enjoy these hobbies,” she says with a smile. Being adventurous does not come naturally to all, especially in an unfamiliar environment. The next time you are hesitant to join a student organization, or explore a new field of study or skill, remember Eunice’s advice and “throw your hat over the wall.” Taking a step outside your comfort zone will lead you to discover that you are capable of so much more and you’ll be surprised at the many opportunities that are waiting for you. For students interested in research opportunities outside UT Dallas, Pivot, a free, searchable database for internship, programs, and fellowships is available for use. Pivot can also be used for funding insights. The Office of Research also offers a free training seminar “Unlocking Grant Money: Finding Research Funding Today” which provides training on utilizing Pivot.